After either being loud and obnoxious, or trying to avoid the loud and obnoxious, depending on the type of person you were or the amount of friends you were with, the wings come. And what’s on them (or on the side)? DC’s very own condiment, Mumbo Sauce. Now, the mystery of Mumbo sauce is that though it is apart of some sort of dietary uniform for DC, Mumbo Sauce itself isn’t uniformed at all. It always tastes different, and even looks different depending on what carry-out you go to. Sometimes it’s thick and burgundy, like barbecue sauce. Other times it’s bright red and watery, similar to a sweet and sour sauce. Sometimes it just looks like ketchup ad has a tangy taste. It varies. Which always, always, ALWAYS raises the question, what is Mumbo Sauce? Like, what’s the (or one) recipe? Who created it? (I heard it was a Black man. Seriously. Wouldn’t surprise me.) And why can’t I buy it in the store? Better yet, why does it seem like it only tastes good on carry-out chicken? I would NEVER put this on my mother’s chicken. Hmmmm. Note: I took the photo above at some new spot in Rivertowne the last time I was home. The spot is just called “Soul Food,” which should’ve been a dead giveaway that it was owned by Chinese people. 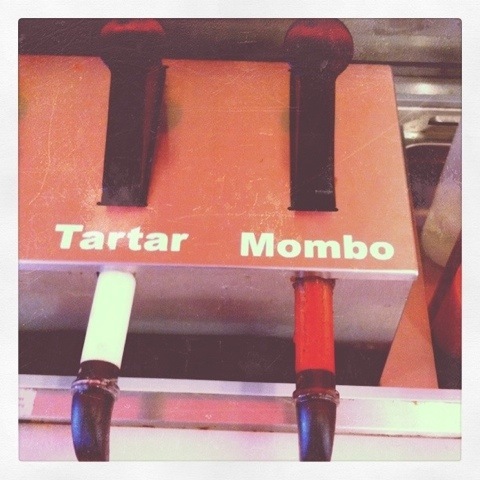 I go in and look at the condiments and there you have it, the 2012 Mombo (Mumbo) sauce dispenser. I guess they got tired of “us” asking for extra, and then getting belligerent when they charge us 75 cents for it. I luv this post b/c it’s soooo true! When I 1st moved to NY, I was so blown to find out that mumbo sauce was a DC thing (only!) and I had to put ketchup on my chicken. Not the same! Years ago I saw it in Safeway and since then I have yet to see it. I hear the main ingredient is duck sauce. And one more thing…I’ve tried using it on other foods too and it’s not the same. Like you said, it only tastes good on carryout chicken and fries. With that said, “let me get 4 wingz, french friez wit ketchup, salt, peppa (not pepper) and mumbo on everything.” That’s how I like it. These are all questions that I have also pondered..lol..No mumbo sauce better than Danny’s..